Scotland’s salmon farming industry will lose its biggest £200 million export market to the US if it persists in shooting seals, according to the US government. The warning comes as new official figures reveal that fish farms in Scotland have been shooting seven or eight seals a month this year, despite the industry’s promise to cut the killing to zero. Six fish farming companies shot 23 seals under licence from the Scottish Government in the first three months of 2016. 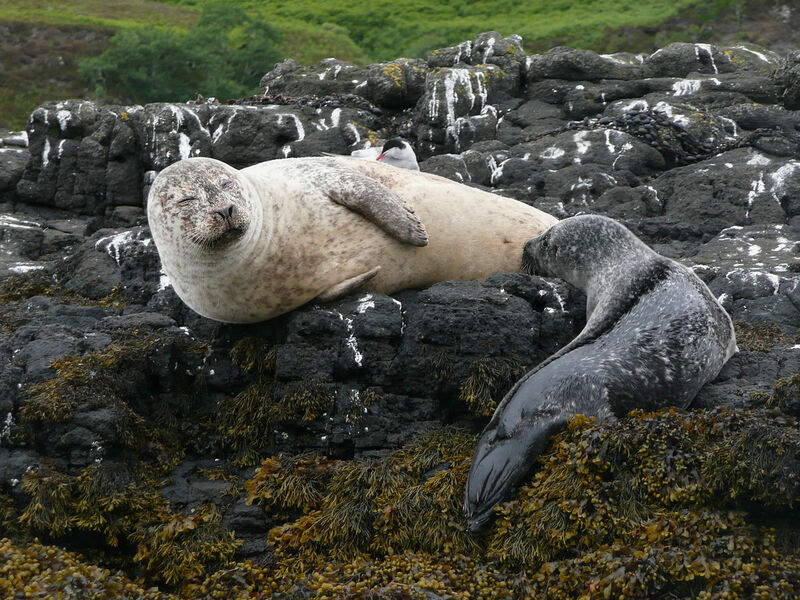 Ten seals were shot by Scottish Sea Farms in Shetland, Orkney, Ross-shire and Argyll. Marine Harvest shot six seals in Skye, Ross-shire and Argyll, and another four were shot by Loch Duart Limited in the Sound of Harris. Three other companies shot one seal each: Scottish Salmon Company, Wester Ross Fisheries and Balta Island Seafare (see table below). Seals are killed to prevent them from eating fish. They also used to be shot by wild salmon netters, but their fishing rights have been curbed by new government conservation regulations. The latest returns to the Scottish Government show that between January and March this year only one seal was shot by a business other than fish farms. It was killed by Lochmaddy Hotel on North Uist, which specialises in angling. The Ferret previously reported on a scientific study showing that hundreds of seals had been shot since 2011 when they were pregnant or feeding young, leaving pups to starve to death. But if fish farms carry on shooting seals, it could harm their profits as well as animal welfare. Their lucrative US export market, worth £213 million in 2014, could be at risk. A new legislative rule agreed by the US National Oceanic and Atmospheric Administration (NOAA) last month will prohibit the import of any fish that doesn’t meet US standards. It is illegal to intentionally kill or injure seals in any commercial US fishing operation. “This rule requires harvesting nations to demonstrate that they prohibit the intentional mortality or serious injury of marine mammals in the course of commercial fishing operations,” said John Henderschedt, director of NOAA Fisheries Office of International Affairs and Seafood Inspection. Countries must have “procedures to reliably certify that exports of fish and fish products to the United States are not associated with a fishery in which intentional killing or serious injury of a marine mammal is allowed,” he added. Campaigners are calling for fish farms to use non-lethal methods of controlling seals, such as anti-predator nets. “Scotland’s trigger-happy salmon farmers have not slowed down at all on their seal-killing spree during 2016,” said Don Staniford, from the Global Alliance Against Industrial Aquaculture. The Scottish animal welfare charity, OneKind, was “deeply disappointed” by the number of seals shot this year. “These animals are simply trying to feed themselves and can’t be expected to steer clear of fish farms that have been placed within their habitat,” said director Harry Huyton. The Scottish Salmon Producers’ Organisation, which represents the fish farming industry, reiterated its intention to reduce the number of seals shot to zero. “The Scottish salmon farming industry is acutely aware of its responsibility to both its fish welfare and the welfare of marine mammals which live alongside farms,” said chief executive, Scott Landsburgh. Fish farm companies all stressed their commitment to cut seal deaths. Scottish Sea Farms said it had reduced “lethal interactions” with seals 50 per cent a year since 2014. It had invested over £1 million in anti-predator nets, and was using acoustic devices to keep seals away from salmon cages where possible. “This is a significant spend that shows our determination to find alternative methods to protect our stock and eliminate the need for last resort control,” said the company’s head of fish health, Ralph Bickerdike. The Scottish Salmon Company said it was committed to using new technologies and deterrent systems in line with industry best practice. “Our intention as a company and as part of the wider Scottish aquaculture industry is to reach zero,” said a spokeswoman. Wester Ross Fisheries declined to comment. Balta Island Seafare and Lochmaddy Hotel did not respond to requests to comment. The Scottish Government pointed out that it had ended the unregulated shooting of seals, resulting in a 65 per cent reduction in seals shot under licence between 2011 and 2015. Photo thanks to Nevit Dilmen, CC BY-SA 3.0. A version of this articles was published in the Sunday Herald on 11 September 2016.